Fore wing of Lepium elongatum. From Crampton (fig. 1) . 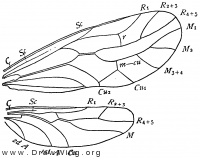 Fore wing of Amphientomum paradoxum. From Crampton (fig. 2) . Wing of Stenopsocus. From Comstock (fig. 258) .